your will be done, on earth as it is in heaven. 11 Give us today our daily bread. At that time the disciples came to Jesus and asked, “Who, then, is the greatest in the kingdom of heaven?” 2 He called a little child to him and placed the child among them. 3 And he said: “Truly I tell you, unless you change and become like little children, you will never enter the kingdom of heaven. 4 Therefore, whoever takes the lowly position of this child is the greatest in the kingdom of heaven. 5 And whoever welcomes one such child in my name welcomes me. For a few weeks we have been and will be working with our understanding of heaven. Last week we shared what we thought Heaven would be like — peace – happiness – the usual roads of gold – angels – God and Jesus — and many more. The reality is that we may be ready for heaven, but we do not know anything about heaven. As we have seen in our discussions last week – we have a variety of images of heaven – clouds, God – eternity — some of us think that Heaven could be continuous worship and a very long sermon – some say that would be boring! The truth is that we really do not know what heaven is like. We only have the scriptures to give us a glimpse of. Some key New Testament scholars remind us that at the time of Jesus people did not have the ideas of heaven that we have at this time – 2000 years later. Jesus referred to heaven as a garden – sometimes as a great banquet — heaven had heavenly bodies. It was in the Middle Ages that our understanding of Heaven and Hell came in to being through the eyes and art work of Dante and Michelangelo. Dante — Dante’s heaven is depicted as having souls in a hierarchy of spiritual development, based at least in part on their human ability to love God. Here are nine levels of people who have attained, by their own efforts, the sphere in which they now reside. The Bible, however, is clear that no amount of good works can earn heaven; only faith in the shed blood of Christ on the cross and the righteousness of Christ imputed to us can save us and destine us for heaven. Michelangelo — The Last Judgment is a fresco by the Italian Renaissance painter Michelangelo covering the whole altar wall of the Sistine Chapel in Vatican City. It is a depiction of the Second Coming of Christ and the final and eternal judgment by God of all humanity. The souls of humans rise and descend to their fates, as judged by Christ who is surrounded by prominent saints. The first is embodiment – that is where the physical and the spirit of the human being is one — in the body is what embodiment means. 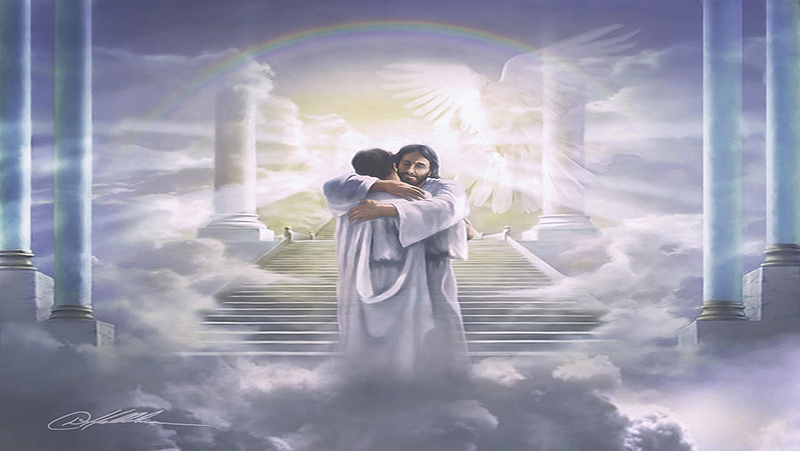 That is why we constantly refer to Jesus Christ as the resurrected body – body and spirit are one – not a disconnected spirit from the body. The influence of the Greeks – separated the body from the spirit – and that lingers today and continues to cause us confusion as to what “Christ has risen” really meant. God, in the creation story declares that the creation of the human being is good – we read this all the time and we will explore this later on in February. In the New Testament, the apostle Paul writes about the conflict between the Spirit and the Flesh—- humans are both spirit and flesh. Humans can be lead by the Spirit – but the dangers in living by the flesh is one’s on doing. 5 For we know that if the earthly tent we live in is destroyed, we have a building from God, an eternal house in heaven, not built by human hands. 2 Meanwhile we groan, longing to be clothed instead with our heavenly dwelling, 3 because when we are clothed, we will not be found naked. — 5 Now the one who has fashioned us for this very purpose is God, who has given us the Spirit as a deposit, guaranteeing what is to come. Jesus points to heaven and earth — not other worldly — where the heaven and earth are to come are beyond time and space. God does not destroy – but brings heaven and earth together. God continues to remind us that creation is good – not evil. It is true that we, as humans have lost some of that goodness that God speaks of because we are inclined to sin – which is our actions that separate us from God. I am going to show you a short clip about heaven and earth from the Field of Dreams. Ray Kinsella (Kevin Costner) is a novice farmer who lives in rural Iowa with his wife, Annie, and their young daughter Karin. Ray’s deceased father, John Kinsella loved baseball, the Chicago White Sox, and Shoeless Joe Jackson, who was banned from baseball for his part in throwing the 1919 World Series during the so-called 1919 Black Sox scandal. His father, though, seemed “worn down” by life. While walking through the cornfield, Ray hears a voice whisper, “If you build it, he will come.” He imagines a baseball field in his cornfield. Annie is skeptical but she tells him to follow his vision. He works on the field for the next couple of days, hoping to find out what will happen. Neighbors stop along the road to watch and heckle as he plows under the corn. He waits all year to see whatever happens. Nothing happens, leaving a dejected Ray. Ray hears the voice again, speaking about the golden days of baseball. The voice says: “If you build it, HE will come”, and glances toward a player near home plate in catcher’s equipment. The player removes his mask, and Ray recognizes his father, John, as a young man. At his wife’s urging, Ray introduces John to his granddaughter, Karin, catching himself before telling Karin who he is, and simply introducing him as “John”. As his father is heading toward the outfield, to leave with the rest of the players, Ray asks his father to play catch, finally calling him “Dad”, as father and son choke back tears. As they play catch, a long line of cars begins approaching the baseball field – people coming to watch the game… thus fulfilling the prophecy that people will come to watch baseball. Perhaps there is more heaven on earth than we realize. We seem to be dismissive of that statement with all of the troubles and evil inclinations that we see and hear daily. But God sent Jesus to restore – to reclaim – to embody heaven and earth together – not separate. So, we come to believe the words that Jesus says — the even death cannot separate us of the God of creation. Our relationship with God begins here and now and deepens and becomes richer and more real as our life goes on. Yes, we have storms in our lives and there is a judgement for us, but our faith continually reminds us that God through Jesus is reaching out to us – seeking to reconcile us with our loved ones and neighbors. We really do not know the end time and what it will be like. Certainly, there have been many books that try to scare us and attempt to teach us a narrow view. We can begin to be a part of the new age – the coming of Heaven on earth. We can continue to seek God in our daily lives by forgiving people and restoring our relationships with others who have hurt us. We can follow up on what it means to follow Jesus – especially his words about loving neighbor as our selves. Jesus has said – that unless you are becoming like little children you will not inherit the kingdom of God. – becoming more trusting, more loving and more caring – life can pass you by. What is given to us in our relationships with people does not disappear with death – it is enhanced as we see heaven and earth together in the future. Is this Heaven – no! this is Iowa! ← What’s The Big Deal About Heaven?